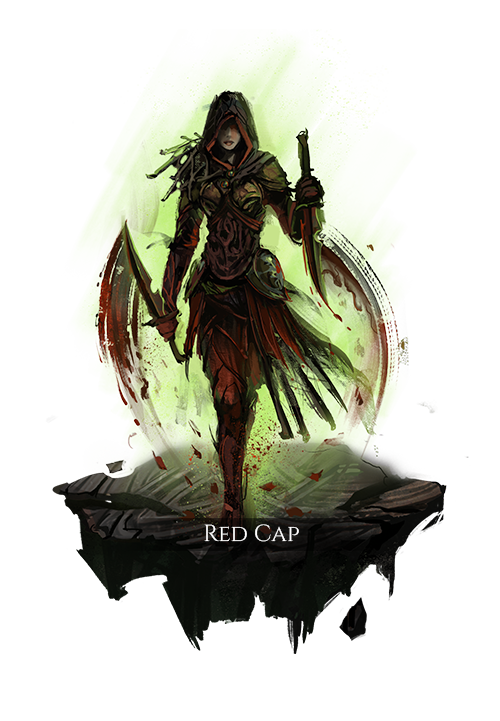 Of all the classes that have learned to use the Veil, the Red Caps are perhaps the most extreme. The blood of their enemies allows them to open a pathway through the Veil. They also drape themselves with the souls of their enemies like death hoods, which take on the reddish tint of their Veil pathway. The blood of my enemies is the pathway to power. Loses blood over time down to a minimum threshold while outside of the Veil. Exiting the Veil creates a local disturbance that drains blood from players entering or exiting the Veil nearby, for a moderate duration. The user is unable to gain blood from the use of abilities on enemies who do not possess blood. Quickly regenerates blood while within the Veil. Usable within a short duration after exiting the Veil. Inflicts high damage on the target, and applies a physical debuff to the target that will drain a high amount of blood and transfer it to the user the next time they receive a wound. Applies a physical debuff to nearby enemies which allows the user’s attacks that penetrate armor to drain blood from them for a moderate amount of time. Destroys a nearby enemy corpse and gains an amount of blood from it based on the user’s weapon damage. Enters the Veil at a high blood cost that is reduced by the number of bleeding enemies in a large area around the user. Sprays the user’s remaining blood over the target, causing a high amount of panic and applying a physical debuff that greatly reduces their vision and movement speed for a moderate duration. Greatly increases the temperature of enemies nearby, and reduces their blood. The amount of blood loss inflicted is based on the blood they are already missing with a bonus based on the amount of blood the user has remaining above the threshold set by Withering Thirst.